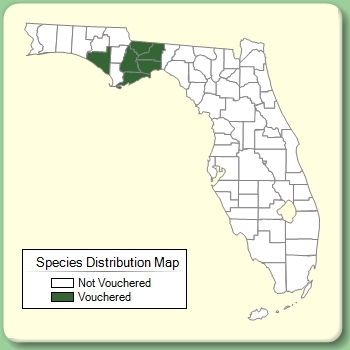 Plant Notes: Recent work segregates S. austrina as a separate species also occurring in Florida (Semple et al. 2016). Citation SOLIDAGO GRACILLIMA Torrey & A. Gray, Fl. N. Amer. 2: 215. 1842. Type: FLORIDA: Without data, Chapman s.n. (lectotype: NY; isolectotypes: GA, K(2 shts), NY). Lectotypified by Semple, Sida 20: 1615. 2003. Aster gracillimus Aster gracillimus (Torrey & A. Gray) Kuntze, Revis. Gen. Pl. 1: 318. 1891. 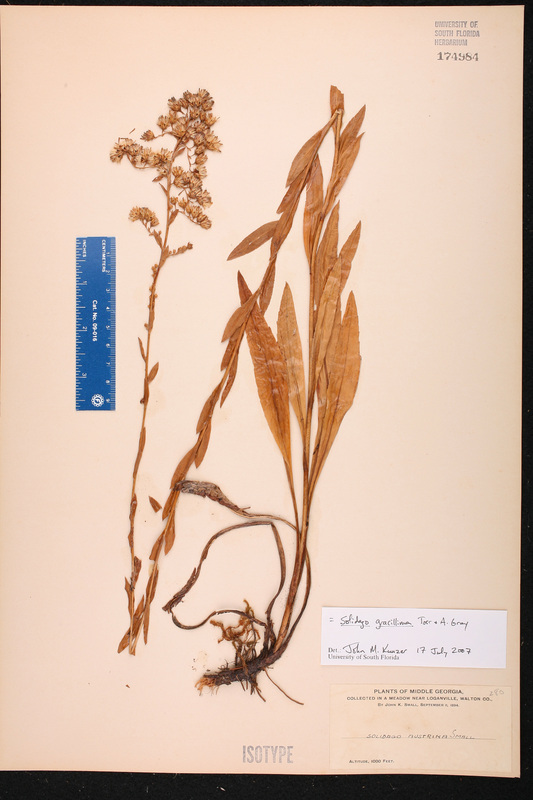 BASIONYM: Solidago gracillima Torrey & A. Gray 1842. 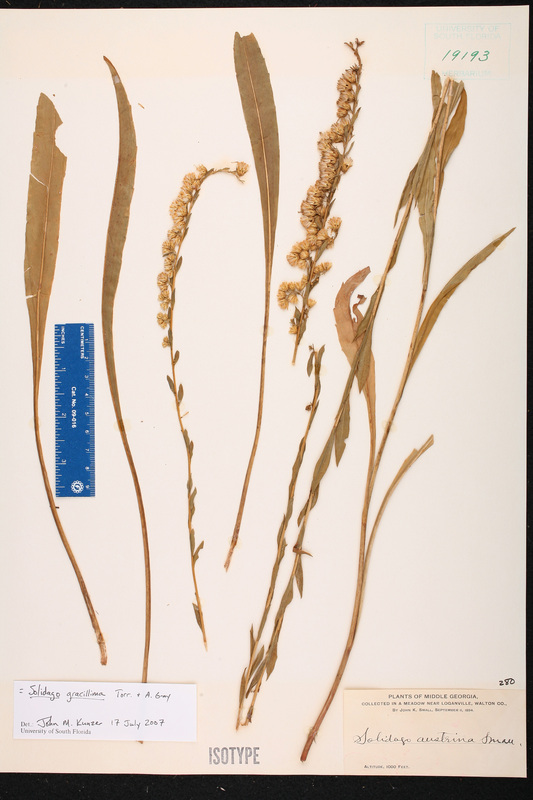 Solidago stricta subsp. 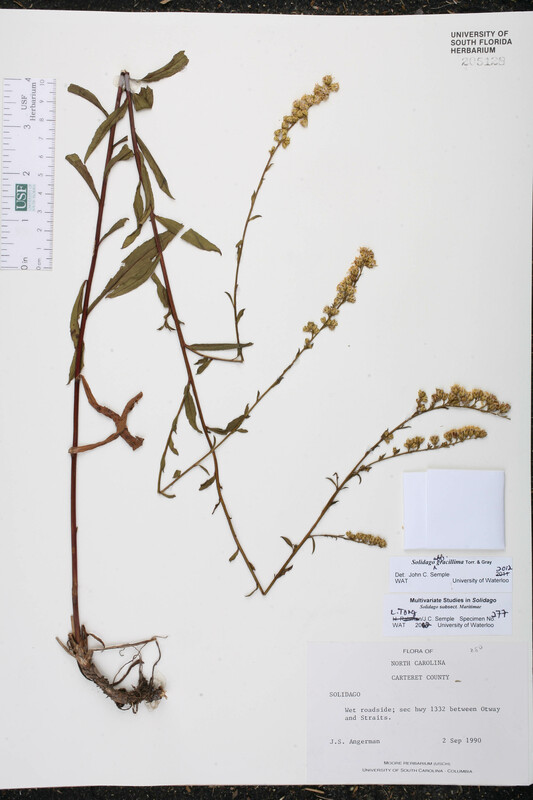 gracillima Solidago stricta Aiton, subsp. gracillima (Torrey & A. Gray) Semple, Sida 20: 1615. 2003. BASIONYM: Solidago gracillima Torrey & A. Gray 1842. Solidago austrina Solidago austrina Small, Fl. S.E. U.S. 1200, 1339. 1903. TYPE: GEORGIA: Walton Co.: Loganville, 11 Sep 1894, Small s.n. (holotype: NY; isotype: GH). 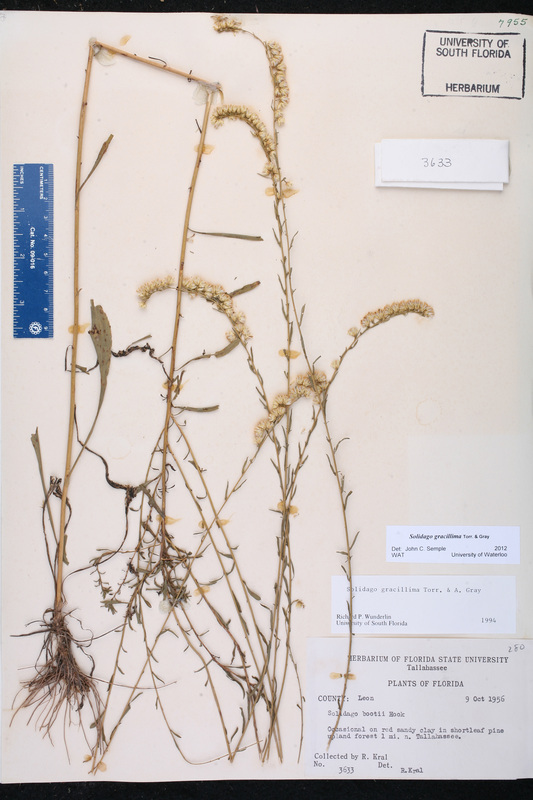 Solidago perlonga Solidago perlonga Fernald, Rhodora 40: 469, t. 532(1-4). 1938. TYPE: VIRGINIA: Southampton Co.: NE of Courtland, 11 Sep 1937, Fernald & Long 7670 (hohlotype: GH; isotypes: NY, PH, US). USA Georgia Walton Co. 11 Sep 1894 J. K. Small s.n. USA North Carolina Carteret Co. 02 Sep 1990 J. S. Angerman s.n.